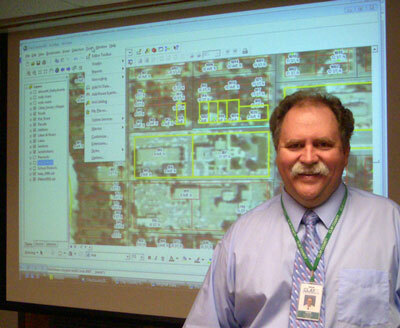 Mark Sloan, GISP has been a GIS leader for local government in Greater Minnesota. As the Clay County GIS Coordinator, he has moved GIS from the backend of the county’s land records process to the forefront. He is involved with every department from emergency management to central administration to the highway department and land records offices. He has developed a national model for working with local government across the county for capturing addresses and coordinates for all new lots and buildings utilizing GPS and GIS technology. Beyond his own county, Mark has been the chair of the Fargo-Moorhead Metropolitan GIS Committee since 1992 and he is a founder of the Minnesota County GIS Association (MCGISA). Mark is currently the co-chair of MACO e-Counties, a member of the Governor’s Council on Geographic Information and has presented at nearly every GIS/LIS annual conference for the past decade. 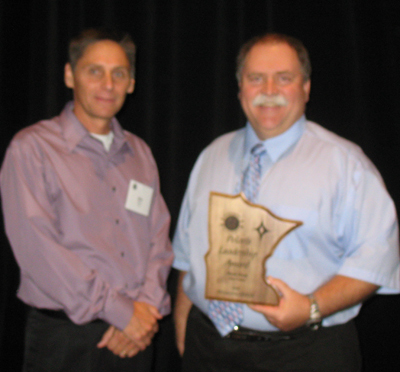 2008 Polaris Award recipient Mark Sloan with nominator Ben Verbick.